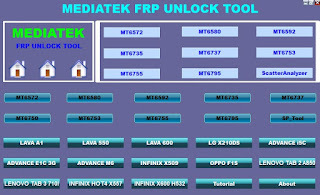 The MTK FRP Unlock Tool is a service tool that allows you to bypass the bidding or FRP protection form MediaTek smartphones and tablets. In addition, this is a desktop device for the MTK FRP device MediaTek smartphones and tablets, MTK FRP device with a touch flashing and FRP format address, without any flashing box on the MTK CPU bypass Google Account. Allows to bypass. This MTK FRP device also supported Android 5.0, 5.1, 6.0, 6.1, 7.0, 7.1. Factory reset protection is a security feature on the FRP Android 5 lollipop and after the factory reset above the phone to insert the email before you, to sync the device to confirm the device's identity For you will be asked. In this tutorial, we show you how to get a Google Account of MediaTek Devices through FRP through the MTK FRP tool. How to use the MTK Unlock Tool? First of all, you can download the MTK FRP Unlock Tool from here, which is free to download. After downloading, you can easily install on your device. Select the complete complete USB data cable and a part of the data cable is connected by each other with MTK-based smartphones and computers. You can tab on the FRP lock option. This will give you an option to unlock the phone or bypass the phone's FRP lock left. Finally, you can find that the device got many other features like removing phone lock, pattern lock or pin lock. If you have mentioned any of the tools for the right use. It supports various mediatek chipset including MT6572, MT6580, MT6592, MT6737, MT6753, MT6755, MT6795, MT6750. It enables you to use various types of FRPs such as the Advance E1C 3G, the Advance i5C, the Advance M6, the Infinite Hot 4 X557, the Infix X509, the XXL X5, the Lava 550, the LeA 600, the LeA A1, the Lenovo Tab 2 A850 LC, Lenovo. Also allows to remove from Tab 3 719 I, LL X210 DD, Oppo F1S, Infix X552 etc. How to Download MTK FRP Unlock Tool? The software download link with the latest and the latest MTK FRP Toolbox has been released very easily by its developers. We are sharing only official site links to our users from the official website. Now you can easily download the MTK FRP Unlock Tool for Windows from the following download link. The link downloaded in the end is just mentioned. Just click on the download link and get it completely free. If you need help or your device does not work, you can notify us without any sense. We will try to guide you. 0 Response to "MTK FRP Unlock/Bypass/Remove/Reset Tool Lalest Version Free Download For Windows"